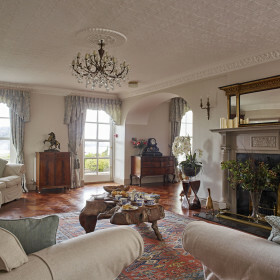 Between the mountains and the sea, The Old Rectory sits on a secluded elevation with breath-taking panoramic views over the Conwy Estuary and Conwy Castle. 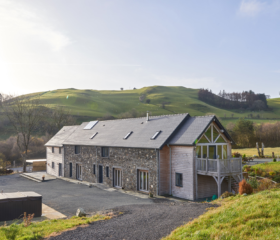 Wander the stunning gardens, invade the games room, fire up a film in the 3D movie room or relax and enjoy mountain views from the hot tub. 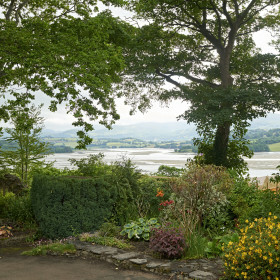 The Old Rectory sits on an elevation above the Conwy estuary, with extensive uninterrupted panoramic views from the coastal sands, to the Snowdonia mountains; from the sweeping valleys to the ancient Conwy Castle and marina. The flora is magnificent; the house more so. 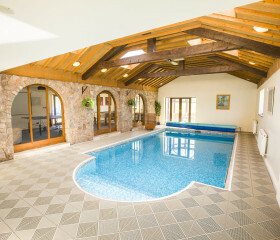 Here, you can live in grand style all day, then chill out in the hot tub in the evening. 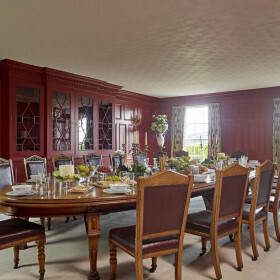 Fix up a dinner party with catering beneath the chandeliers. Eat al fresco in the charming private courtyard around the authentic firebowl, or in the front terrace overlooking the gardens. 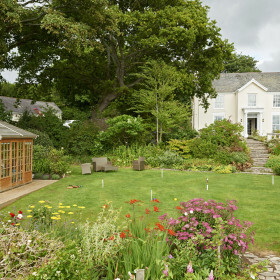 Wander the magnificent gardens, stocked with unusual specimen plants, enjoy the games room with air hockey and table football, or fire up some family films in the 3D movie room. 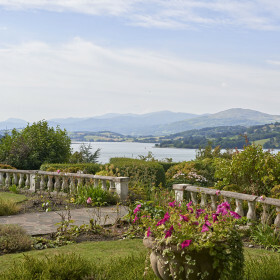 The two and a half acres of gardens here are part of a bigger picture. It’s a pretty one, too. 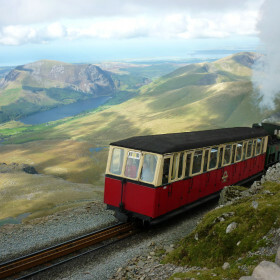 Here, the North Wales coast meets the mountains and valleys of Snowdonia, in a lush verdant landscape of rock and fern, orchid and cowslip. 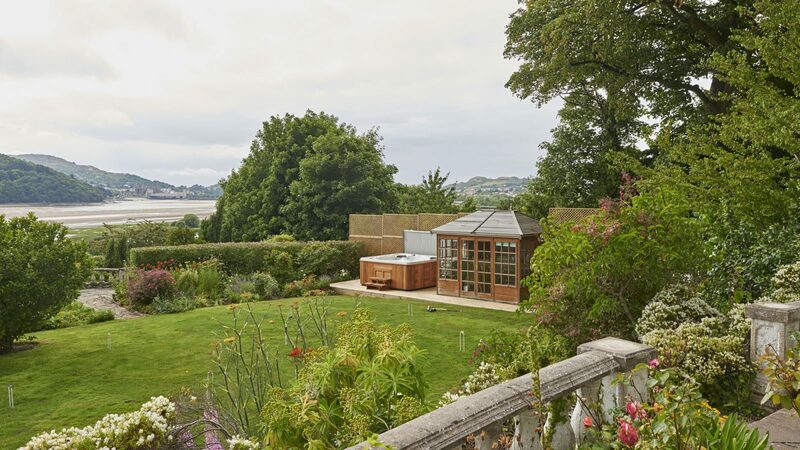 Above the estuary sits the garden with family lawn, ideal for a game of croquet. Once you’re through the hoops and have hit the peg, it’s time to laze and lounge in the eight-seater hot tub that sits by the summerhouse. Let the bubbles soothe your limbs. You deserve it, life’s tough here in the grand lap of luxury. 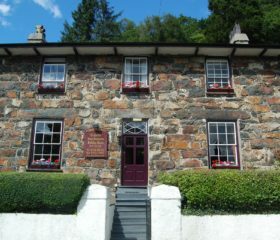 You can eat al fresco here, breakfast in the charming courtyard, lunch in the coastal breeze overlooking the mountains or dine as the sun sets over Conwy Castle. Beyond the garden borders sits the ever changing estuary. 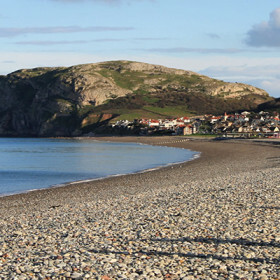 Lose time watching the paragliders, leisure boats and fishing vessels on the rhythm of the tides until the evening draws in and the sun disappears behind the mountains. As winter approaches, the snow capped mountains bring a touch of magic to Christmas time at The Old Rectory. 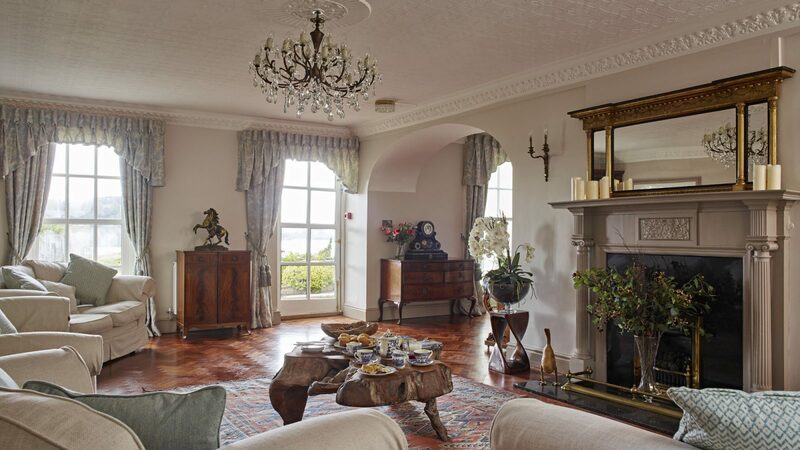 Llandudno is the grand old lady of the North Wales coastline and the magnificence of the living spaces at The Old Rectory reflects that heritage perfectly. 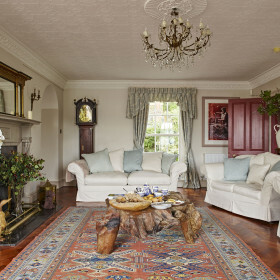 This is a world of open fires, ornate cornicing, glittering chandeliers and squishy sofas. 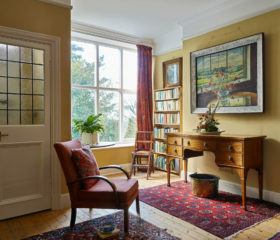 But The Old Rectory feels lived-in, warm and welcoming. It feels like home. 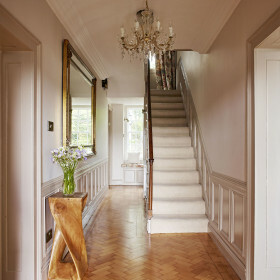 Spaces are vast, perfect for entertaining, or just escaping with a book awhile. 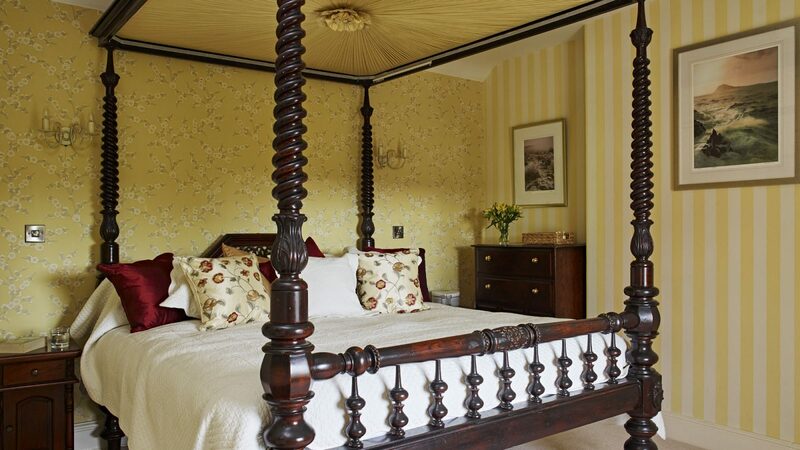 The Old Rectory is a grand country house, but there’s nothing ancient about the facilities. 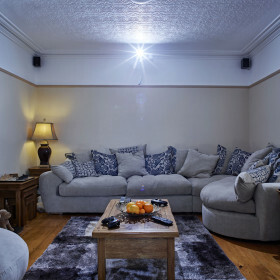 Get the troops together for a movie night in the 3D theatre, catch the big game on Sky Sports, or keep in touch with the wifi. There’s table football and air hockey in the games room, a Playstation 4 and Xbox, too, or table tennis in the courtyard. If the mist rolls in over the estuary the action needn’t stop. 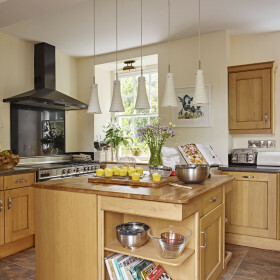 The choice is yours: the range cooker sits ready, with space for everyone to chip in while you chop and chat. 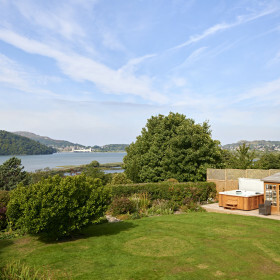 Or there’s a barbie outside so you can braise and glaze your way to slow-cooked flavour in the Welsh coastal air. Something to celebrate? 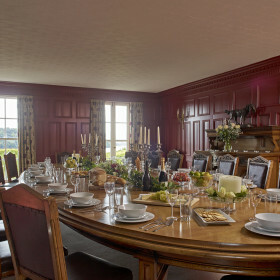 You can summon our chefs to do you a dinner party for 20 around the giant table, in the magnificent dining room with its panelled walls and leather chairs. We’ll even wade into the washing-up afterwards. Eating out? 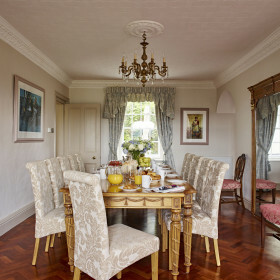 Bodysgallen Hall has fine dining in a splendid setting and the Kinmel Arms specialises in fresh local fish, or you can taste the Portuguese influence at Chandlers Brasserie. Signature Restaurant is not too far for breast of pigeon or seared seabass. 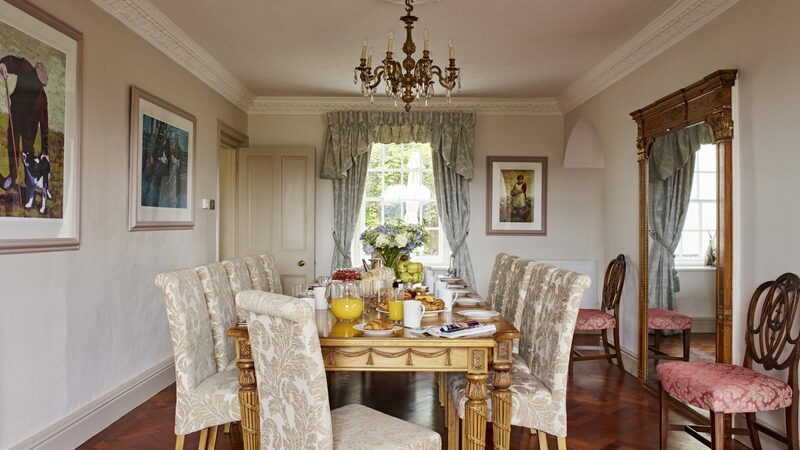 From a single family to a full-on guestfest, The Old Rectory has space in spades, with flexibility at its core. 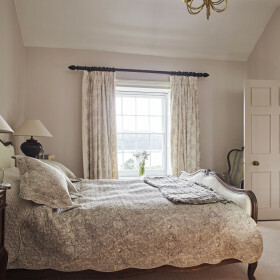 Curtains are luxurious, carpets are deep and sheets are soft cotton. 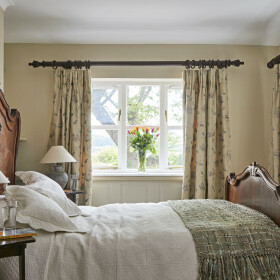 In the Main House, the first bedroom is a king. Bedroom two comes with two large single beds, bedroom three comes with a superking zip-and-link bed, while bedroom four offers a superking. Bedroom five is downstairs and caters for three singles or one king and one single. Four of the rooms have ensuite bathrooms and some offer zip-and-link flexibility. 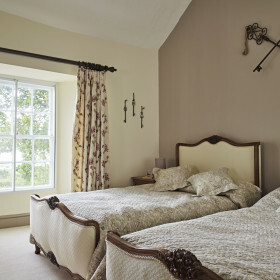 The Coach House brings the total number of bedrooms to eight. 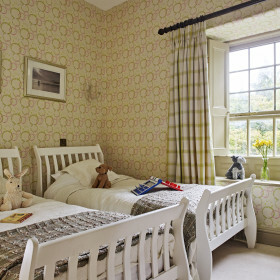 Bedroom six offers a small double and one single bed, while bedroom seven is a kiddie haven, with two twins or one zip-and-link king. The final bedroom is a queen. There’s a sofa bed in the Main House sitting room and two further foldaways. Even more family, even more friends. What could be more perfect? 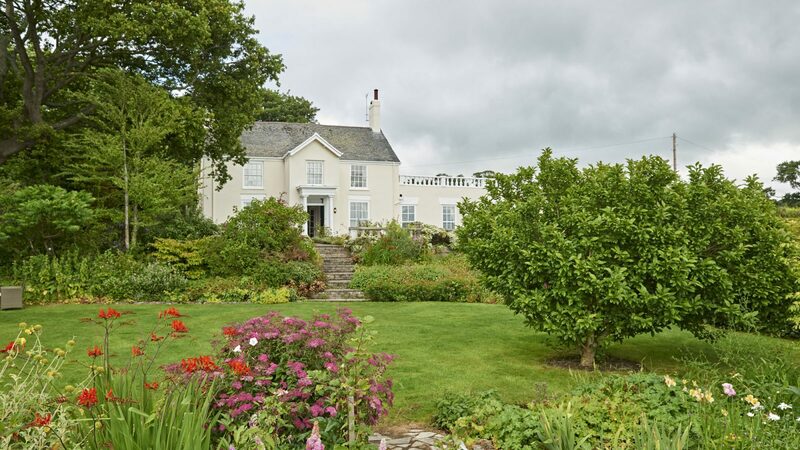 The Old Rectory is perfectly situated to discover all that North Wales has to offer, beaches like Pensarn are perfect for a peaceful day of donkey rides and doughnuts, but thrill seekers will be won over by the cutting edge of outward-bound activities. 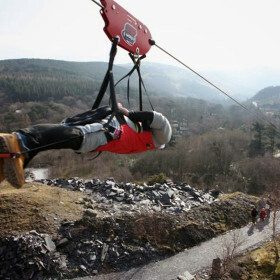 Become a 60-second Superman at 100mph Zip World, learn to surf at the World’s first Wave Garden or ride up the Snowdon railway to the roof of Wales.